The Avengers are the most powerful superheroes on the planet, but they can't always eat shawarma. Sometimes, they have to grab a meal on the go, and that's where sandwiches come in. 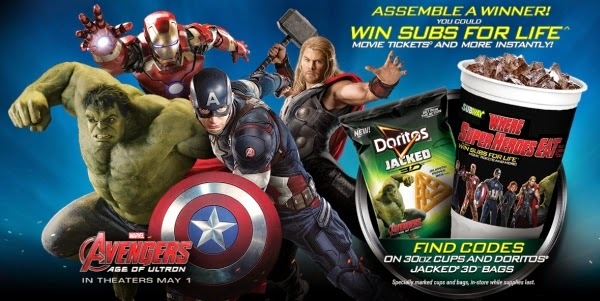 We're in a contest right now to try to win tickets to see an early screening of Avengers: Age of Ultron, sponsored by Subway. That led us to ask the question, if the Avengers went to Subway, what would they order? Yeah, we were up late that night. Anyway, we think it would go something...like this. Why? Black Widow is a deadly warrior, but she doesn't have superpowers to fall back on. She has to exercise and eat right to maintain her fighting edge, and fit into her black catsuit. She would go with a vegetarian sandwich, light and nourishing. Possibly with Russian dressing. Why? Captain America comes from a simpler time, a time of hot dogs and apple pie. If he walked into a Subway, he wouldn't go for the fancy stuff. He'd go with a basic cold cut combo. On white bread. Why? Like Black Widow, Hawkeye doesn't have superpowers. What he does have is extraordinary skill with a bow and exceptional eyesight. He'd probably go for a tuna sandwich, because fish is rich in omega-3, which protects the blood vessels in the eyes. And it's tuna fish...who doesn't love that? Why? The Hulk is a big guy, and he's not too complicated. He just wants meat and lots of it. The meatball sandwich is just balls of meat, sauce, and bread. He'd probably need to order a couple dozen, though. Why? Tony Stark is a man of the world who enjoys the finer things. He's a man of complex and expensive tastes. But when he has to grab and go, he wouldn't go with just a bologna sandwich. He'd probably go with the sweet onion chicken teriyaki. Because it's fancy. Why? Thor is royalty from Asgard, where he often dines in the halls of Valhalla. When he's celebrating a victory with his fellow Viking warriors, he's used to feasting on turkey legs and whole pigs. But when he's on the go on Earth, he'd settle for nothing less than hunks of steak smothered in cheese. What sandwiches do you think the Avengers would eat? What sandwiches would other superheroes or supervillains eat? I think you nailed them. Although Thor and Hulk will definitely need more than one sub. I'm with Hulk I love the Meatball Subs. I always order the Veggie Delight. This post has made me hungry. Those are good choices. I wish they still had the seafood salad or whatever it was called. That was yummy. But meatball is always good.